After Bishop Van de Ven’s death in 1932, Msgr. Francis Van Haver, pastor of Holy Trinity Church in Shreveport, served as administrator of the diocese. A papal bull nominating Fr. 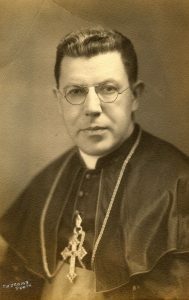 Daniel Francis Desmond of Massachusetts as bishop-elect of Alexandria was issued on December 16, 1932. 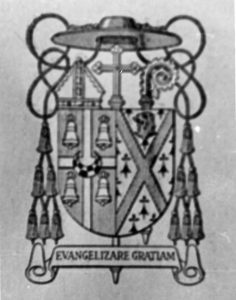 The new bishop-elect was consecrated by Cardinal O’Connell of Boston on January 5, 1933. Bishop Desmond was born in Haverhill, Massachusetts on April 4, 1884, one of 7 children. He graduated from Holy Cross College with a B.A. degree and enrolled at St. John’s Seminary in Brighton. He was ordained a priest on June 9, 1911. He served as an assistant in Beachmont and Medford before his assignment as assistant at St. Clement’s in Somerville in 1916. Fr. Desmond volunteered as an army chaplain and was assigned to the 63rd Infantry, 11th Division on June 1, 1918. Later he was transferred to the transport service and was assigned to the U.S.S. Martha Washington. He was released from the army in September 1919. He returned to St. Clement’s and in 1926 was appointed director of the Somerville Catholic Charities where he demonstrated his organizational skills. Fr. Desmond was sorting castoff shoes when he received the letter of his appointment. Traveling south for the first time in his life, Bishop Desmond was well-received by the citizens of Alexandria who flocked to the cathedral for his installation on February 15. 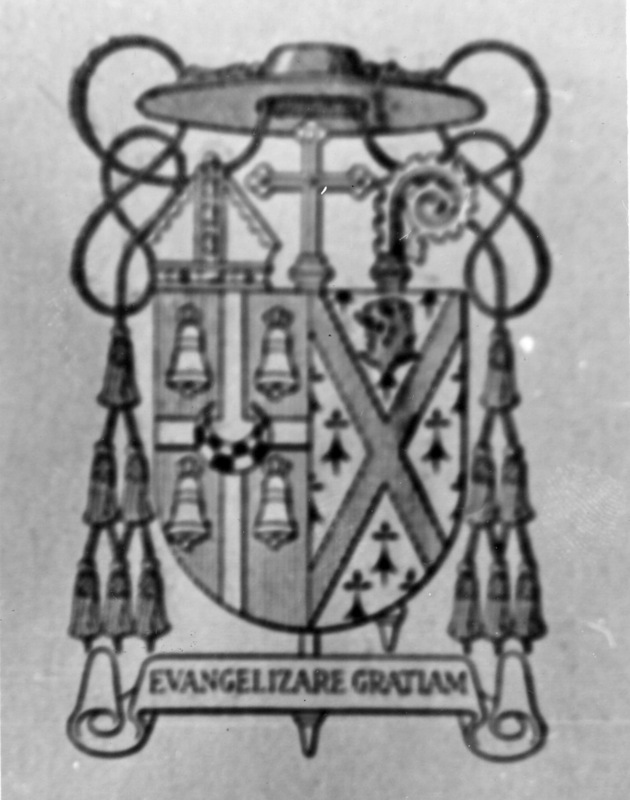 For his episcopal motto, Bishop Desmond chose “Evangelizare Gratium” - ‘To Preach the Gospel of Grace’. Like his predecessors, Bishop Desmond traveled throughout his diocese visiting remote stretches of isolated farms and communities far off the beaten path. With a portable mass kit he offered mass wherever he could gather a crowd. New chapels were erected with the help of friends and benefactors in the northeast together with funds granted by the Extension Society. Thirty-five new churches and chapels were erected or refurbished with help from these sources. During the 12 years of his administration, Bishop Desmond established 26 new parishes in the diocese, many of them for black congregations for whom the bishop showed a special care and concern. To help in this important ministry, Bishop Desmond invited the Josephite Fathers to work in the diocese. Other religious congregations accepted Bishop Desmond’s invitation to labor in north Louisiana. The Franciscans came to work in Monroe and throughout the Ouachita area. The Dominican Fathers took over the parish at Boyce and other mission stations in the area. The Franciscan Sisters of Our Lady of Perpetual Help came south to establish new schools while the Felician Sisters took charge of the hospital at Bastrop. To help with the relief efforts begun under Bishop Van de Ven, Bishop Desmond organized a Catholic Charities bureau in Alexandria funded by a regular collection. To further spiritual formation in the works of charity and to promote devotion to the Blessed Mother, Bishop Desmond encouraged the Sodality movement for boys and girls. 10 new schools were established throughout the diocese and a superintendent of education was appointed to oversee the expansion. A diocesan-wide fund raising effort was launched to help supply funds for the development of a Catholic hospital in Alexandria and a youth center. In 1944, Bishop Desmond suffered a stroke while visiting his family in Massachusetts. He recovered and returned to the diocese to take up his work. The strain of the burden was too much and the bishop returned, in broken health, to Massachusetts where he suffered a second stroke and died on September 11, 1945. At his request, his body was interred in his family’s plot while a Solemn Requiem Mass was offered at his cathedral in Alexandria. Msgr. Henry Van der Putten was designated as the administrator of the diocese. Bishop Desmond was the first native American-born prelate to shepherd the diocese and much credit can be given to him for setting so high a standard for his priests and people. His plans for future expansion, particularly for the establishment of a Catholic hospital and youth center in Alexandria, served as a blueprint for the man who would succeed him.